Updated with state-of-the-practice information, recent data, and new research and findings, Corrections: An Introduction, 5/e, provides a practical approach to the world of corrections. Richard Seiter focuses on what people do in corrections, why they do it, and what challenges face contemporary correctional staff and administrators. 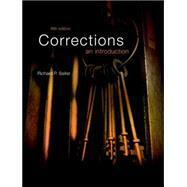 Seiter gives students a first-hand look at corrections, integrating his experience in the field with correctional theory, history, and policy. Coverage of the realities and rationales of actual correctional practices at the local, state, and federal levels allows readers to see how theory is put into practice. Engaging case studies, career tips, and personal insights help students connect with the material and gain a realistic and practical understanding of corrections today. Corrections, 5/e is also available via REVEL™, an interactive learning environment that enables students to read, practice, and study in one continuous experience. Learn more. Richard P. Seiter is a career correctional professional, having worked in prisons and for correctional agencies for more than thirty years. Following receipt of his Ph.D. in Public Administration from the Ohio State University (OSU), he began a career with the Federal Bureau of Prisons BOP and worked in four federal prisons (was warden of two). He was also Director of the BOP Staff Training Center in Denver, Colorado, and was the first Chief of the NIC National Academy of Corrections. He also served as both Assistant Director for Industries, Education, and Training and Chief Operating Officer of Federal Prison Industries, with sales of over $400 million per year of prison-made products. Dr. Seiter was Director of the Ohio Department of Rehabilitation and Correction for almost six years. In this position, he was responsible for all Ohio prisons, the parole board and parole supervision, and many community correctional programs. He managed an annual budget of $400 million and a staff of 8,000, and he oversaw the construction of more than 10,000 prison beds at a cost of $500 million. After retiring from the BOP, he became Professor and Director of Criminal Justice at Saint Louis University (SLU). During this time, he wrote two textbooks, published several articles, and expanded the program and course offerings at SLU. From 2005 until 2011, he was Executive Vice President of Corrections Corporation of America, the largest private prison company in the United States. In this position, Dr. Seiter oversaw the operation of the sixth largest prison system in the country, with 63 prisons, 17,000 staff members, and 75,000 inmates.